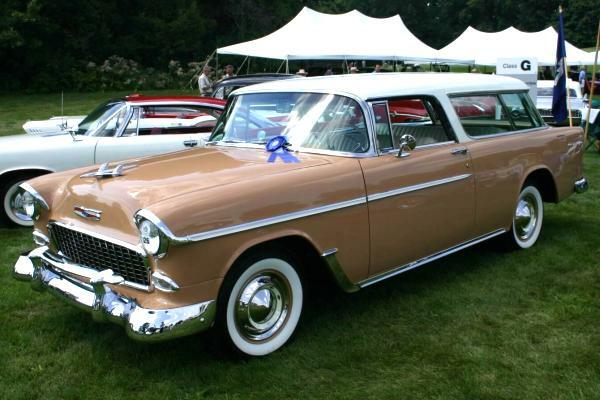 Why it's a "shoebox" Chevy. Specifically a 1956 Bel Air convertible. 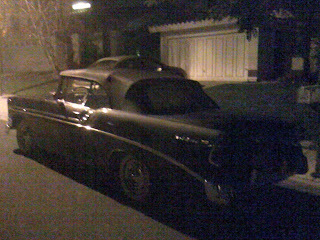 Too bad it was so dark - and that iPhones are pretty much useless in low light. 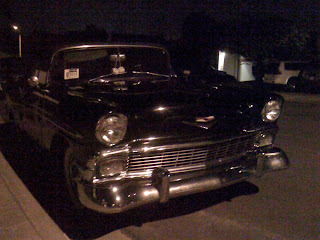 But I still had to snag a shot as it was another interesting car in the 'hood. Personally I like the '55s better (make mine a Nomad please), but this was a solid car that but it looked pretty good in a dark blue/medium blue combo with a dark blue top. I'm also quite certain as this one was "just visiting" as it was gone by morning. And for the most part, this car isn't all that exciting to me, but it sure beats seeing yet another boring Toyota Camry Transportation Appliance.